Beautiful, solid birds-eye maple wood allows for maximum energy transfer to the cue ball. With its TNT shaft your breaks will be highly explosive. 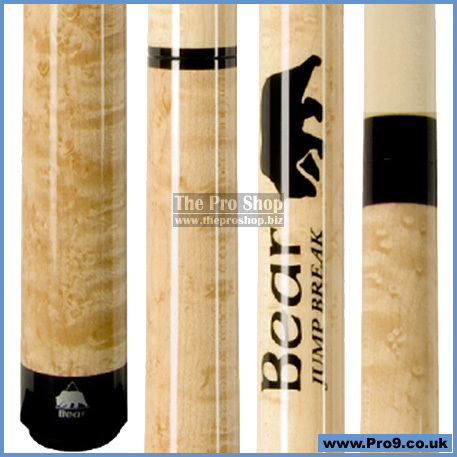 The jump cue is covered with a high tech coating and therefore protected from scratches and other damaging effects. The middle is decorated with an attractive Bear-logo. A special feature is the single-piece, tough phenolic ferrule with a small impression in the centre, which gives you the best support for exact breaks and jumps. An original quick release Uni-Loc-Joint provides superb playability and comfort. This Model comes with a soft bag, joint protectors and a certificate. Suitable weight screws can be found within cue accessories.